Heat oven to 375 F. Mix the cornstarch with the sugar and salt in a large bowl. Add in the strawberries and rhubarb and toss to coat evenly. 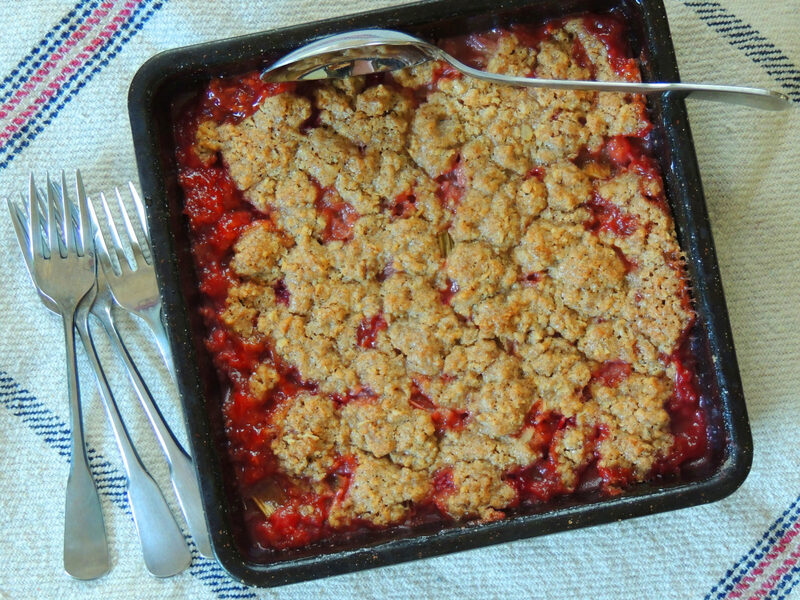 Spread fruit in a 9 inch square or round baking pan. For the topping, add oats, brown sugar, flour, cinnamon, sea salt, and butter to the bowl of a food processor and pulse until blended. Add the cold water and pulse until it starts to clump. Or to do it by hand using a fork, cut butter into the oats, brown sugar, flour, and cinnamon until mixture resembles coarse crumbs. Stir in water until it gets clumpy. Sprinkle topping evenly over fruit. Bake for 35 minutes until golden. Serve warm or at room temperature with ice cream if desired.